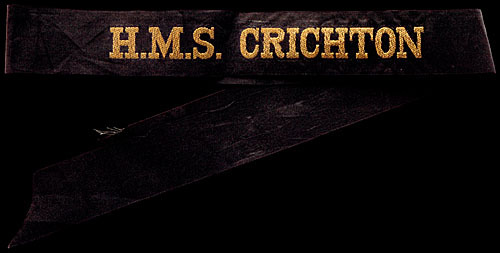 HMS Crichton is amongst the most sought after of all the Golly brooches. 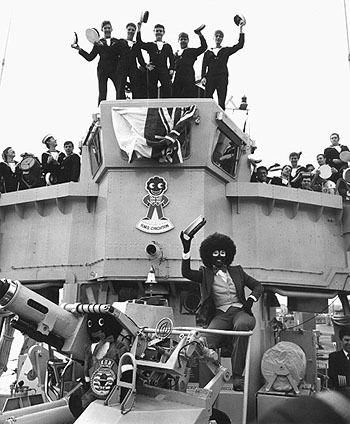 It was issued to all members of the crew of the minesweeper HMS Crichton after they adopted Golly as their mascot in 1983. HMS Crichton was completed in 1953 and broken up in 1987. She was known as a 'Ton' class minesweeper, and one of 118 ships in this class. Their names were derived from British villages and hamlets in the UK ending in Ton. (Thanks to David Axford for his help. Be aware that there is a known copy of this badge. It can be identified from the reverse which reads reissue 2002 n/200 (where n is a number from 1 - 200). The genuine badge has no backstamp. The copy is also larger than the original. Further update: This badge has also been faked with no backstamp. 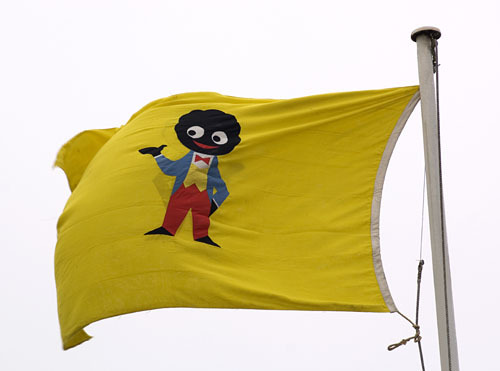 The picture clearly shows the Golly mascot on the ship's bridge. 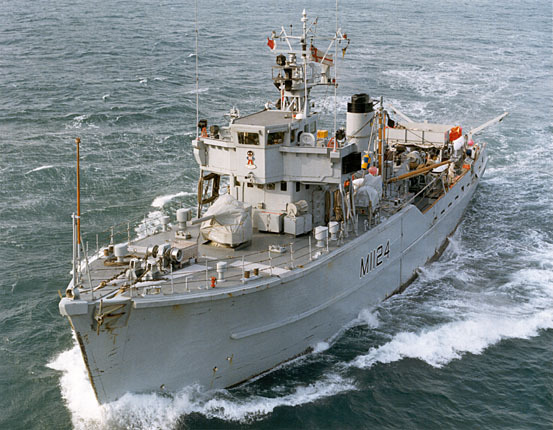 CRICHTON was launched on the 17th March 1953 and started life as HMS Clyde and then HMS St David before assuming her final name in 1977 on joining the Fishery Protection Squadron. She joined the First Minecountermeasures Squadron (MCM 1) in early 1980 having had an extensive refit a Rosyth Dockyard in Scotland. Whilst HMS Crichton was in refit awaiting a new commission, one of the ships company, a young Able Seaman collected The Robertson's Jam Golly badges. He suggested that the Bridge badge should therefore be a 'Golly'. Approval was given by Robertson's Jam and a large Golly some four foot high, was produced at The Fleet Maintenance Unit (FMU) in Rosyth Dockyard. Sailors from HMS Crichton painted the badge during lonely night watches. When the ship finally came out of refit she proudly wore the new Golly badge on her bridge clearly visible on her forecastle. A framed coloured photograph of the ship was sent to Robertson's with a request that a number of sailor golly badges could be provided for the whole ships company. 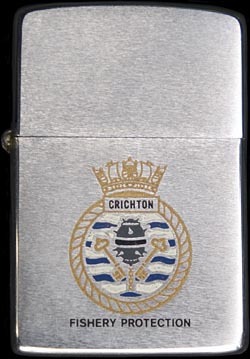 It was much to the surprise of the ships company when a limited edition of only fifty badges was supplied, bearing the name HMS Crichton under the sailor's feet. All the ships company was given a badge each a total of around thirty-two badges. At the time I was serving on the staff of The First Minecountermeasures Squadron. I was responsible for training up the ships company to prepare them for their main tasks at sea. During this training period, all the squadron staff (eight in all) was presented with a badge each by the First Lieutenant and the Ships Company. The ten remained locked in the First Lieutenants safe for new members of the ships company, yet to join. 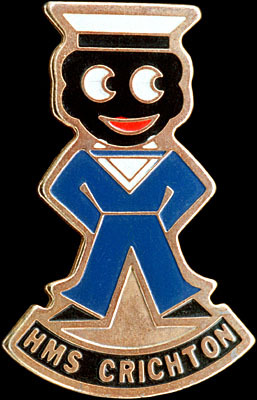 On all our subsequent visits we were always required to wear our Golly Badge before we were allowed onboard. 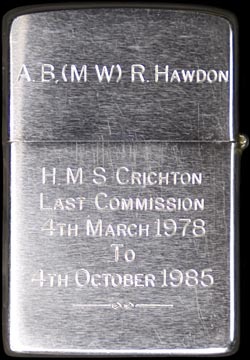 This was the last commission of HMS Crichton before she was decommissioned and scrapped, subsequently no other badges were made. Golly being presented to Crichton after refit in 1983. One of the other items that Robin had in his care was the Robertson's made battle ensign from the ship. There might have been 50 made for the ship but we know that many of the staff at Robertson's had one as well. One lucky lady even requested one (and received it) as a reward for filling in a Robertson's questionnaire. There was also a nursing home of the same name, Crichton House, that ended up with some of the badges. The nursing home was situated in Blackpool and was demolished in 2001. When Crichton House and HMS Crichton were twinned together, members of the crew went to the house to present the badges and a picture of HMS Crichton. Robertsons also donated knitting patterns and chinaware. I believe I must have seen near 50 change hands in the time I have been collecting and the consensus from other collectors is also that there must be more than 50.